Horizillax is a unique horizontal parallax based single page, responsive, wordPress theme. Horizillax can be used for any business, corporate, ..
REDBOWL is a Responsive Joomla Web RESTAURANT template. It comes with subtle design and clean coding structure. 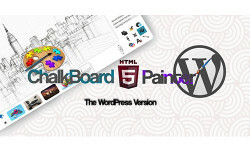 All the features here ..
WordPress version of ChalkBoard Painter – HTML5 /Canvas Browser Painting App Now with a Text Tool including 80 fonts to choose from Give ..